The Station House survives as a private residence. The west ends of both platforms survive as does the covered stairway. A broken Southern Railway sign stands alongside the bridge and a 'target' station sign is mounted above the entrance to the building. The Drovers Way overbridge to the west of the station also survives. 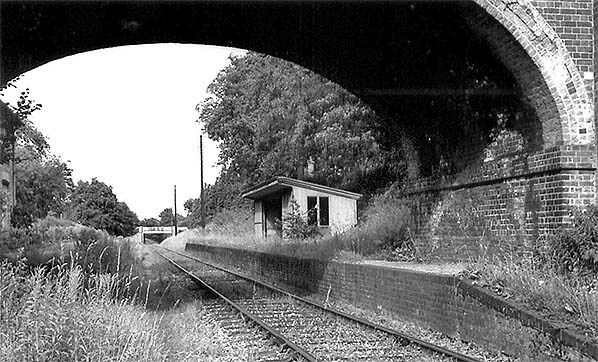 Notes: Ash Green station opened with the line and was provided with two short facing platforms faced with brick. The station was sited in a cutting and the main two-storey building was at the rear of the up platform; the booking office and waiting room were on the lower floor while the upper floor was accommodation for the stationmaster. An external covered stairway took passengers down to the platform with a door into the booking office at the bottom of the steps. The building was of brick construction with a hipped slate roof and a gabled porch on the upper floor fronting onto a small forecourt. The down platform was provided with a timber waiting shelter with a plain upward-sloping roof projecting over the platform as a narrow canopy. Passengers crossed the line using a timbered crossing at the bottom of the stairs. The station was originally called Ash but was renamed Ash Green in December 1876. It reverted to Ash in September 1891 once again becoming Ash Green on 1 October 1895. The station was provided with a small goods yard on the up side. This comprised two sidings running into a large staggered end-dock which was a continuation of the up platform. The 1904 Railway Clearing House Handbook of stations lists a full range of goods traffic including livestock. Access to the yard was beside the station building. The Tongham loop was doubled in 1884, although the 1871 map reproduced below shows that it was already double-track as far as Tongham by that date. After 1884 the station was provided with a signal box at the east end of the down platform opposite the goods yard. In the first decade of the twentieth century, a single siding with a dock was laid on the down side west of White Lane bridge. The goods yard closed on 1 December 1926. From that date the station was unstaffed and downgraded to a halt. 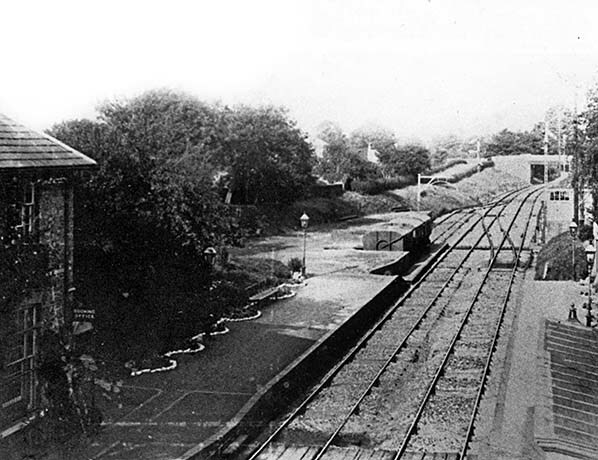 On 17 May 1927 the sidings and signal box were taken out of use, and when the line was singled on 9 February 1930 the up line was removed; as a consequence passengers not only had to come down the covered staircase onto the disused platform, but also had to cross over to the original down platform, which now served both directions. There was drama at Ash Green Station on 27 August 1874, when a horse box and carriage were detached from a Guildford to Southampton train, while a wagon containing the furniture of a signalman who was being transferred, was attached. The train reversed to regain the detached horse box and carriage but, unfortunately experienced coupling trouble which resulted in the two vehicles running back down the 1 in 121 gradient towards Ash Junction. As the guard tried scotching the wheels, four passengers jumped clear while a porter threw ballast on the rails. The two vehicles gained speed and headed towards the junction, where they unfortunately collided with a passing South Eastern Railway goods train. There has been little change at the station in the last 50 years. The station building is now a private residence and the up platform edge is fenced off from the public footpath that runs along the trackbed. The covered stairs are still in place. The west end of the down platform is extant but heavily overgrown. A Southern Railway ‘target’ sign was mounted on a shed adjacent to the station building but has now been moved to the entrance gable. A broken Southern Railway cast iron trespass sign stands alongside the road on the north side of the bridge. During the early to mid nineteenth century, farmers in the area around Tongham, Farnham and Alton were involved with growing hops, which had become the most important industry in the district. Beer was brewed locally and transported by cart to Winchfield station on the main London & South Western Railway (LSWR) line, between Basingstoke and Farnborough, and then by train from Winchfield to London. With hop growing and other agriculture in mind, as well as the possibility of carrying stone quarried at Alton, the LSWR applied to Parliament to build a branch line from their station at Guildford to a field at Alton (near the road to East and West Worldham) with intermediate stations at Ash Green, Tongham, Farnham and Bentley. The line was authorised on 16 July 1846, and the LSWR also planned to connect the new branch with their main London - Basingstoke route by building a line through Pirbright and joining up at Ash Green, but this section was never sanctioned. The contractor appointed to build the Alton line was Thomas Brassey who was also responsible for the construction of several other railways in the area, including the line from Guildford - Godalming. The consulting engineer was the LSWR's Joseph Locke, who had succeeded Francis Giles in 1837, while the resident engineer was a Mr Vance, who was described as a ‘bearded giant of a man with an intimidating character’. Meanwhile, the Reading, Guildford & Reigate Railway Company (RGRR), supported by the South Eastern Railway, opened their line from Reading to Farnborough on 4 July 1849, as part of a grand scheme to link the Great Western Railway with the Channel ports, thus avoiding London. After coming to an agreement with the LSWR, the RGRR arranged to reach Guildford by using part of the new Guildford - Alton branch (which was under construction) at what was to become known as Ash Junction. The section of the RGRR line from Farnborough to Ash Junction opened on 20 August 1849, coinciding with the opening of the first section of the Guildford - Alton branch from Guildford to Ash Junction. On 8 October 1849, the Alton branch was opened as far as Farnham, and finally from Farnham to Alton on 28 July 1852. The same year, the RGRR became part of the South Eastern Railway, who had operated the line since it opened. Ash Green station opened with the line but Tongham did not appear in public timetables until October 1856. 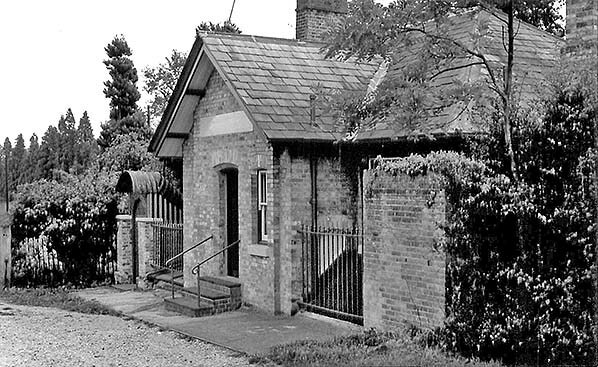 To provide adequate facilities for military training, and to meet the need for maintaining large garrisons of troops, the War Office was granted £100,000 in the construction of two camps at Aldershot, one north and the other south of the Basingstoke Canal, started immediately, and the new centre was officially opened by Queen Victoria in July of the next year. The Guildford - Alton branch played a large part in the transformation of Aldershot from a small remote hamlet in 1855 (consisting of a church, two important houses called Aldershot Manor and Aldershot Place, two or three farmhouses and a village green), into the most important military town in the country. At first, Ash Green station was used for handling the building materials, but later this role was transferred to Tongham (which was closer to Aldershot) when sidings were added to the station. The contractor responsible for building much of the new camp at Aldershot, including the Royal Pavilion, was George Myers who, on 15 March 1855, agreed terms with the LSWR to build a temporary line from Tongham to Aldershot, in order to speed up the construction work. The route for this contractor’s line went from a trailing junction facing north-east at a point between Tongham and Ash Green stations, near Bin Wood, and then turned north-west towards Aldershot, running between the present-day sites of the Greyhound Inn and the Bricklayers Arms at Ash. From here the line crossed North Lane, south of Thorn Hill, and then ran parallel with the High Street finishing at the rear of Badajos Barracks just short of the Farnborough Road, now the A325. When construction of the town was completed, the contractor’s line was removed. Tongham station, along with Farnborough became a railhead for the military traffic. Bradshaw shows five weekday and two Sunday trains in each direction in February 1863. As Aldershot continued to grow, the local inhabitants felt that they needed their own station and, after coming up with various schemes of their own, they managed to persuade the LSWR to build a line from a junction near Pirbright, on the main London - Basingstoke line, to join the Guildford - Alton line between Tongham and Farnham at what became known as Farnham Junction. This new line opened on 2 May 1870 and provided a station, not only at Aldershot, but also at Ash Vale (originally named North Camp & Ash Vale, not to be confused with the present day North Camp station, which was also in use at the time), while the section of track between Farnham Junction and Farnham was doubled at the same time, although from Farnham to Alton remained single until 2 June 1901. When the line originally opened, signal boxes were required at Ash Junction, Ash Green, Tongham and Farnham. Later, when the line was extended from Farnham to Alton, boxes were added at both Bentley and Alton. After the line from Aldershot joined the Tongham - Farnham section, a box was added at Farnham Junction. By this time, the original line to Alton had been extended in 1865 by the Mid Hants Railway (originally known as the Alton, Alresford and Winchester Railway) for 17 miles, to a junction on the main London - Southampton line, just 2 miles north of Winchester. With the new, more direct line from Pirbright Junction via Aldershot to Farnham opening in 1870, the original line from Ash Junction to Farnham Junction became known as the ‘Tongham loop’ and, in many ways, it was the beginning of the end for this section, which started to lose some of its importance. The situation was not helped by a further development which took place in 1879, when a spur was opened to link the South Eastern Railway station at Ash with Aldershot, and from then on even some of the Guildford to Farnham traffic started to use this new spur, and continued o do so, even though the line between Ash Green and Farnham Junction was doubled on 4 June 1884. On 1 September 1891, the last station in the area was opened at Wanborough, between Guildford and Ash Junction, at the request of Sir Algernon West, the personal private secretary to the Prime Minister, William Gladstone. Sir Algernon lived at Wanborough Manor and was also a director of the LSWR. In 1856 a gas works was opened at Aldershot, on the north side of Ash Road, near the River Blackwater. Coal was received via Tongham station, from where it was carted by horse to the works. A direct line from Tongham station to the gas works was first suggested in October 1889, but it was not until the Aldershot Gas & Water Act of 1896, that permission was granted. Tenders were received for the construction of this new line, which would be about ¾-mile in length and run north from a trailing connection just west of Tongham station. The contract was awarded in May 1898 to Thomas Turner of Blackwater, while the contract for the steel incline and bridge over Ash Road was awarded to Sir William Arrol & Co. The line to the Gas Works was opened by October 1898, and because LSWR locomotives were not permitted to use this line, the Gas Works Company purchased their own locomotive from W G Bagnall Ltd of Stafford, a 0-4-0 saddle tank which had originally been obtained by W G Bagnall from Henry Hughes & Company of Loughborough. The locomotive was later christened ‘Patricia’ after the elder daughter of Mr R W Edwards, Chairman of what was now called the Aldershot Gas, Water & District Lighting Company. In April 1910, Bradshaw shows nine trains in each direction on weekdays with three down and two up services on Sunday. By July 1922 the weekday service had improved to 11 trains in each direction but the Sunday service had been withdrawn. In 1923 the LSWR became part of the newly-formed Southern Railway, who later decided to make the several changes. On 1 December 1926, both Ash Green and Tongham stations were reduced to unstaffed halts and Ash Green was also closed to goods. The double lines from Ash Junction to Farnham Junction were singled on 9 February 1930, and a few years later the sparse passenger service was discontinued after the last train on Sunday 4 July 1937, although the line stayed open for goods, and to serve the gas works. On 22 August 1940 an ammunition train made up of 47 wagons was standing on the single line between Tongham and Farnham Junction when a bomb hit one of six open wagons, exploding the contents and sending shells all over the railway. Two of the Southern Railway employees who lived nearby, ganger George Keen and lengthman George Leach, were awarded the George Medal for their courage after they had separated the burning wagons from the rest of the train. After nationalisation in 1948 the Southern Railway passed into the hands of British Railways Southern Region. Because by the early 1950s the goods service was down to two trains per day, the new owners decided that from 21 November 1954 the rarely-used section of track between Farnham Junction and Tongham should be taken out of use, making Ash Junction the only means of access to the line. By the late 1940s the goods traffic was handled by Maunsell U class 2-6-0 locomotives and later by Bulleid Q1 class 0-6-0's. Like many similar lines which had either recently closed or were still open for goods only, the Tongham line received two interesting railtours. On 26 September 1953, the Railway Enthusiasts' Club of Farnborough special train called ‘Hants & Surrey Tour’, pulled by Drummond L12 class 4-4-0 No. 30434, visited the line on a trip from North Camp Station to Ash Green and Tongham via Guildford. 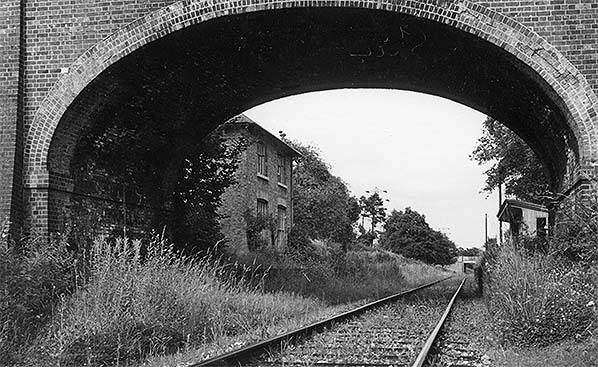 Although it was hoped to continue from Tongham through to Farnham Junction, this section of line was considered to be unsafe due to subsidence, so the train returned to Guildford before embarking on a non-stop run to Kingsley Halt and then Bordon. The Railway Enthusiasts' Club ran another special to Ash Green and Tongham on 5 October 1957, which was called ‘The Compass Rose’ and was pulled by Drummond M7 class 0-4-4T No. 33051 and covered goods-only lines and little-used spurs in Hampshire, Surrey and Berkshire. This was the last official passenger train to use the line. Once the coal traffic for the gas works ended in 1957 when gas production ceased, the twice-weekly goods service to Tongham was not considered enough reason to keep the line open, so British Railways Southern Region decided that the last revenue-earning goods train to call at Tongham would be on 31 December 1960. The final train was pulled by Q1 class 0-6-0 No. 33025, in the hands of driver Plumpton and fireman Ansell, both of Guildford, and steamed into Tongham at 10.05 a.m., where it was met by senior porter White of Farnham. In the brake van with guard Wickens of Guildford were several members of the Railway Enthusiasts' Club of Farnborough, who had come to pay their last respects to this local line. The signal box at Ash Junction stayed open until 1 April 1963, while the very overgrown track remained in position until the points were removed on 4 April 1965. 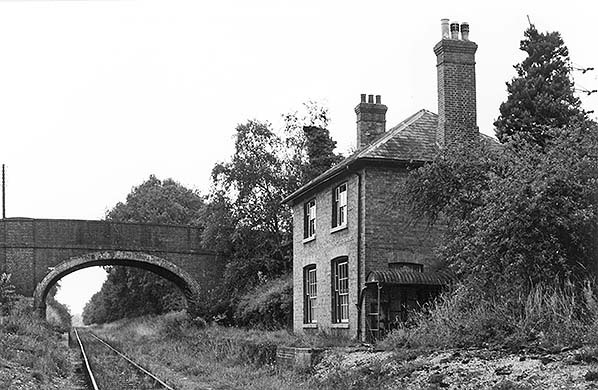 Although the section of track between Farnham Junction and Tongham had been taken out of use on 21 November 1954, the signal box at Farnham Junction remained open until 5 May 1964. This was found necessary because of the need to split the section between Aldershot West (latterly Aldershot B) and Farnham East (latterly Farnham A) boxes. The box was demolished in 1966. Today part of a line is now a public footpath between the Drovers Way overbridge to the east of Ash Green station and a point just short of Tongham station. An unofficial footpath continues to Ash Junction. To the west of Tongham most of the route is lost under road improvements (A331 Blackwater Valley Relief Road & A31 Guildford Road). The site of Farnham Junction is lost under the A31. Tickets from Michael Stewart. Route map drawn by Alan Young. Bradshaws from Peter A Harding. 1871 1:2,500 OS map shows that the line was double at this time although the west end of the Tongham loop was not doubled until 1884. Detail is difficult to make out but the staggered goods dock at the east of the up platform is seen with two short sidings. Access to the goods yard is to the east of the station building. Ordnance Survey maps always showed the station as Ashgreen but timetable and tickets always rendered the name as Ash Green. 1898 1:10560 (6-inch) shows Ash Junction to the east and the Reading, Guildford & Reigate (SER) Railway's Ash station to the north-west. This station opened on 20 August 1849, two months before the LSWR station. Both were called Ash but to avoid confusion the LSWR station later became Ash Green. 1935 1:2,500 OS map. The line has now been singled and the up line lifted. The goods yard has now closed and all the sidings have been lifted. The staggered dock to the east of the up platform is clearly seen on this map as is the dock alongside the lifted down siding. The signal box has also been demolished. ‘LB’ by the station indicates a letter box. 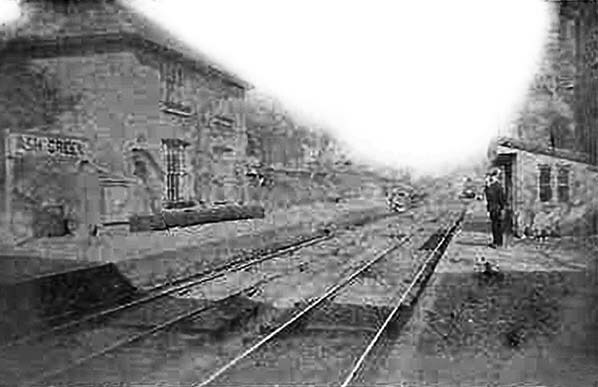 A very poor quality picture shows Ash Green station in use, probably in the first decade of the twentieth century. A train from Guildford is approaching. 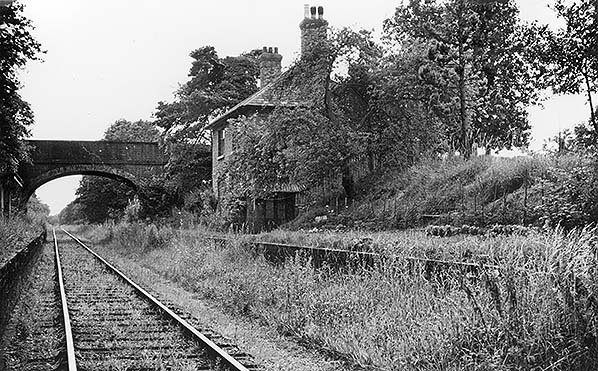 Ash Green Halt looking east from the overgrown up platform c1960. The up platform has been out of use since 1930. Although not used since 1937 the timber waiting shelter on the down platform still appears to be in good condition. Drovers Way bridge is seen in the distance; this is the last bridge before Ash Junction. The entrance to the station house on the upper floor of the station building c1960. Presumably the rectangular panel above the door was for the station name. Looking east towards Ash Junction c1960. Although overgrown in this view, both platforms continued under the bridge. Ash Green Halt looking west towards Farnham Junction c1960. Ash Green Halt looking west from the down platform c1960. The covered stairway is seen at the side of the station building and the entrance double-doors into the booking office can just be made out at the bottom of the stairs.